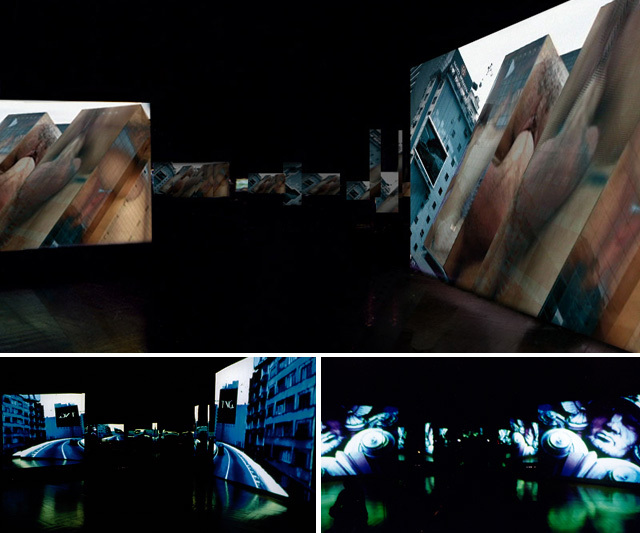 FLUOROSCÓPIO video-installation derives from the concepts used on the short movie FLUORÊSCENCIAS. Simultaneities, folds, continuity solutions, sutures. Images within images, a lot of cities within other cities. It has as its objective to put the spectator in the scene, in this time cut, outside the chaos. Through this detached view and pointed by its own desires, it aims to enquire the destiny and the function of this century’s beginning mega centers. support: COVISERV, TELEFONICA, ZETA FILMES, CIDADE INTERNET and MICROCOM INFORMÁTICA. support: ESPAÇO DIGITAL, DIGITAL FILMES, VIDECOM, ESTÚDIOS MEGA, FALLMS FILMS, JKL CINEMATOGRÁFICA.